For the final month of the year, the “headline” unemployment number, which is the percentage of people in the labor force who say they are actively seeking work, held at 7.8%. Two frequently highlighted considerations are that, one, certain demographic groups are way above that percentage and, two, the rate would be significantly higher if the American labor force hadn’t slowed its pace. If the labor force of the last five years had continued to grow at the rate of the prior five years, the unemployment rate would be 8.6%. 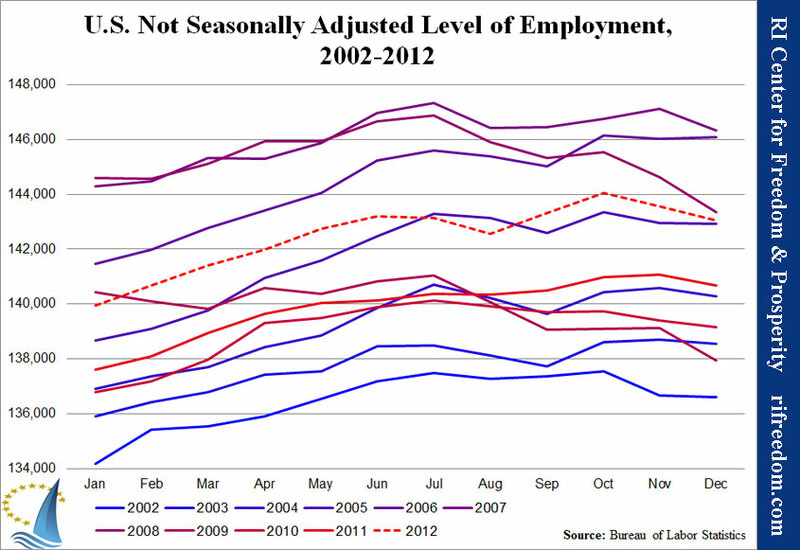 Each of the following charts shows the monthly number of Americans who say that they are currently employed. The bluer the line, the older the data; the redder the line, the newer the data. The dashed line is 2012. The first chart shows the data seasonally adjusted, which is the more common way of reporting the numbers; the second chart shows them without the adjustment. The seasonally adjusted story of 2012 is utter stagnation with a big, unusual upswing from August to October. Without the seasonal adjustment, the story is a typical increase in employment for the first half of the year and late-summer down-slide followed by an unusually large and consistent spike in October, the month before the election. Effective with the release of The Employment Situation for January 2013, scheduled for February 1, 2013, new population controls will be used in the monthly household survey estimation process. These new controls reflect the annual updating of intercensal population estimates by the U.S. Census Bureau. Historical data will not be revised to incorporate the new controls; consequently, household survey data for January 2013 will not be directly comparable with that for December 2012 or earlier periods. A table showing the effects of the new controls on the major labor force series will be included in the January 2013 release. It will certainly be interesting to see which way the new methodology shifts the numbers.